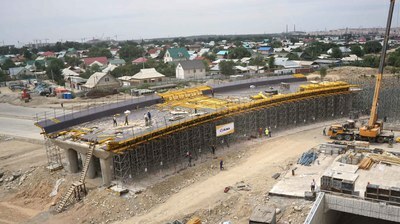 The 427.5 m long flyover, located on the boarder of Alatau and Zhetysu districts, will contribute to greatly streamlining traffic on the intersection with the capacity of 170 thou cars per day. Construction of a 304.2 m long flyover at exit no. 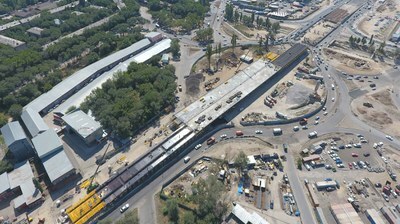 9 over Ryskulov Street is one of 20 projects planned under the Almaty transport link network improvement programme for 2012-2018. The unique element of the project is a reinforced-concrete pylon measuring 108.5 meters in height. This bridge is part of the most important motorway currently under construction in the Slovak Republic. It is a three span viaduct bridge with spans of 55.9 and 60 m measured along the central axis of the viaduct.